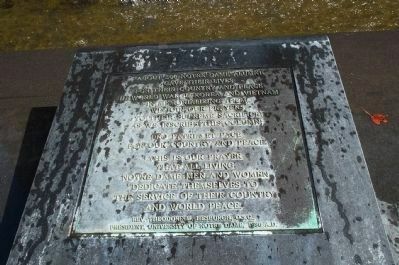 Marker on the west side of the fountain. This is our prayer that all living Notre Dame men and women dedicate themselves to the service of their country and world peace. President, University of Notre Dame, 1986 A.D. 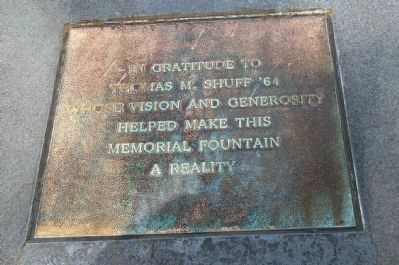 In gratitude to Thomas M. Shuff '64 whose vision and generosity helped make this memorial fountain a reality. Maude C. and John W. Clarke of Chicago, Illinois. Location. 41° 42.138′ N, 86° 14.202′ W. Marker is near South Bend, Indiana, in St. Joseph County. Touch for map. 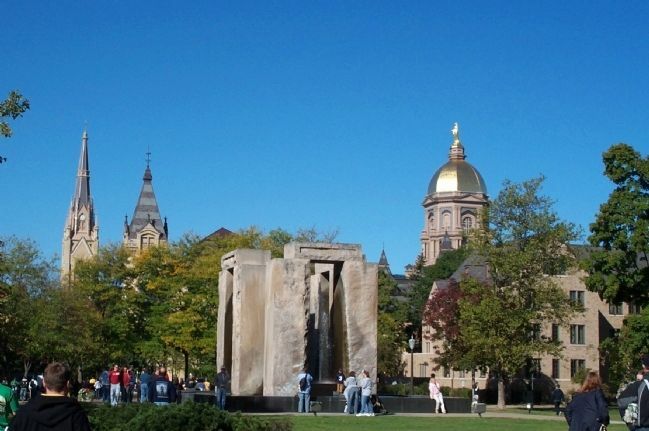 The Clarke Peace Memorial Fountain is on the University of Notre Dame campus in the Fieldhouse Mall in the south end of North Quad. Marker is in this post office area: Notre Dame IN 46556, United States of America. Touch for directions. Other nearby markers. At least 8 other markers are within walking distance of this marker. Notre Dame Fieldhouse (a few steps from this marker); Vetville (approx. 0.2 miles away); Thomas A. Dooley, M.D. '48 (approx. 0.2 miles away); Chaplain Corby of Gettysburg (approx. 0.2 miles away); Knute Rockne (approx. ¼ mile away); From a Letter of The Rev. Edward Sorin, CSC (approx. ¼ mile away); Old College (approx. 0.3 miles away); University of Notre Dame Band (approx. 0.3 miles away). Touch for a list and map of all markers in South Bend. More about this marker. 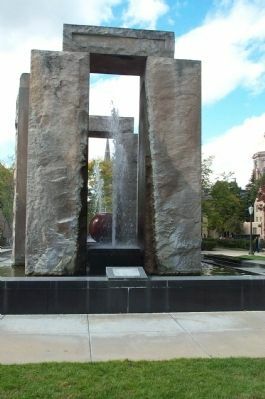 Four limestone arches rise up out of a rectangular black granite fountain basin. 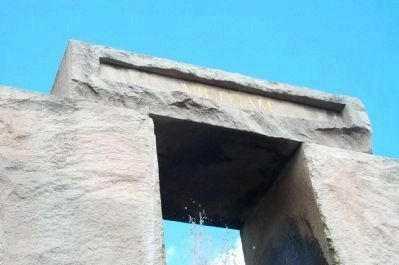 Each arch is constructed of two 20 ton rough-hewn columns with a limestone cap. Within each arch is a fountain. 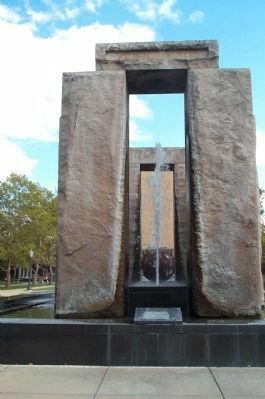 In the center of the pool is a brown granite sphere with a fountain. West side of the fountain with the inscription Pro Patria et Pace (For our Country and Peace). The sphere in the center represents the Earth. 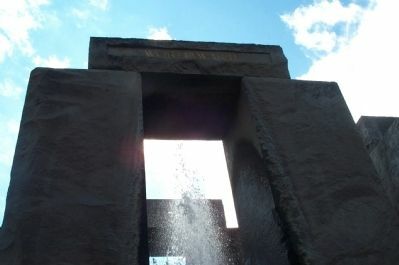 This fountain has been been nicknamed Stonehenge or Domehenge. Close up of west cross beam with inscription Pro Patria et Pace. Korea inscription on the cross beam. 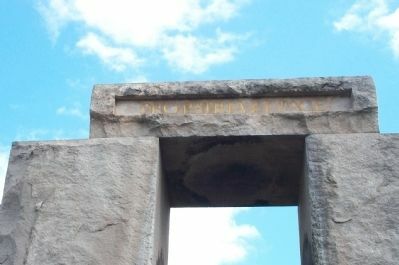 World War II inscription on the cross beam. 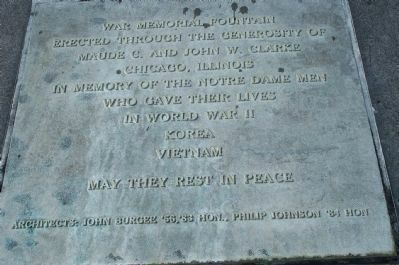 Vietnam inscription on the cross beam. View of the fountain from the east end of the Fieldhouse mall. Sacred Heart Basillica is on the left and the Golden Dome of the Main building is on the right. More. Search the internet for Clarke Peace Memorial. Credits. This page was last revised on June 16, 2016. This page originally submitted on October 7, 2008, by Kathy Walker of Stafford, Virginia. This page has been viewed 3,552 times since then and 20 times this year. Photos: 1, 2. submitted on October 7, 2008, by Kathy Walker of Stafford, Virginia. 3. submitted on October 8, 2008, by Kathy Walker of Stafford, Virginia. 4, 5, 6, 7, 8, 9. submitted on October 7, 2008, by Kathy Walker of Stafford, Virginia. • Kevin W. was the editor who published this page.